On Thursday evening Tite finally lost his 100% record in competitive fixtures as Brazil drew 1-1 with Colombia in the sweltering heat and suffocating humidity of Barranquilla. Willian’s first half screamer was cancelled out in the second period through a pinpoint Radamel Falcao header, making it just 28 points from a possible 30 on offer for the current Brazil boss. The game followed Thursday’s 2-0 win over Ecuador, a full match report of which can be read here. At his best he is a magnificent tormentor of defenders, at his worst a 25-year-old toddler throwing his toys from the proverbial pram. During the 180 minutes of football played in this international break we saw both sides of Neymar’s game. In the eight competitive games under Tite prior to this month we had seen far more of the former, the player who can kill games with apparent ease and mercilessly punish defensive errors. Against Argentina Neymar was superlative and he had won the previous game versus Colombia with a terrific strike 15 minutes from the end. Playing from the left, and assigned far more defensive duties, it appeared as if Tite had finally got him under the sort of control Dunga never could. But against Ecuador on Thursday he reverted to the Neymar of old. Ecuador, as many teams do, clearly targeted him from the first whistle, fouling, harrying and leaving a little bit on him at every opportunity. Their tight defensive shape also denied him any space in which to work. He became frustrated and for a spell either side of the break went around diving histrionically at every slight touch, and trying to win the game alone, running into cul-de-sacs when a simple pass would have been far the better option. Against Colombia it would be a test to see how he reacted, then. Remember that it was against Colombia in the 2014 World Cup that Neymar’s tournament ended after having his back broken in a feisty affair and against the same opposition that he was sent off at the 2015 Copa America after being marked out of the game by Carlos Sánchez. He went through the rest of the game in the same manner, including the provision of a delightful first-touch, volleyed assist for Willian’s spectacular goal. 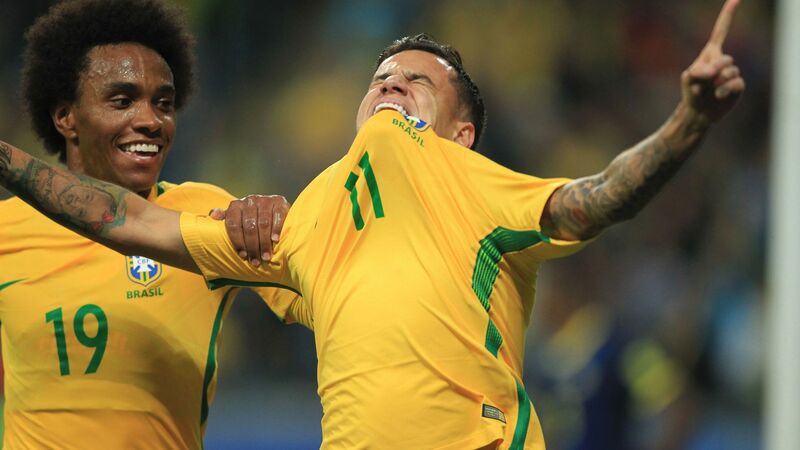 In both games Brazil started with Willian, who played well against Colombia, on the right of midfield and introduced Philippe Coutinho in the second half. Rather than taking off Willian to make way for Coutinho, however, Tite opted to remove his number 8, Renato Augusto, thus introducing a more creative presence in the central portion of the pitch. Against Ecuador it was extremely effective, the game changing completely after the Liverpool wantaway’s entrance. His goal was a piece of footballing fine art and he provided some incisive, defence-splitting passes that had been conspicuous in their absence during the first hour of the game. Against Colombia he was less influential but still found a through-ball for Gabriel Jesus that, if finished with greater composure, could have handed Brazil all three points and maintained Tite’s 100% record. It is not the most radical shift but represents a slightly different option for the manager to take to Russia in 10 months time. 6 or 7 unfilled spaces in the squad? Brazilians do not like Roberto Firmino. He has never played for a big club here, going straight from Série B to Hoffenheim at a tender age, and many casual fans see little of Liverpool in the Premier League. They also do not see him as a true Brazilian centre forward. His lithe, intelligent movement off the ball and relentless pressing does not fit with the Brazilian ideal of what a number 9 should be. People here want to see a Romário or Ronaldo type figure, always lurking on the shoulder of the last defender and lethal in the area. The people who have it in for the Liverpool man would tell you, then, that there are seven spots up for grabs in the Brazil squad for the World Cup next year. If Tite were speaking openly though, he would say there were 6. Tite is a big fan of Firmino and, barring injury or a dramatic loss of form, he will surely be on the plane to Russia. As will goalkeeper Alisson; defenders Daniel Alves, Fagner, Miranda, Marquinhos, Thiago Silva, Marcelo, and Filipe Luís; midfielders Casemiro, Fernandinho, Renato Augusto, Paulinho, Willian, Philippe Coutinho, Neymar, and forward Gabriel Jesus. That leaves six spaces up for grabs; two goalkeepers, one centre-back, a central midfielder, a wide attacker and a centre-forward. The battle for the two goalkeeping berths is a tight one with a slew of options at more or less the same level. A good season for Ederson would probably see him book his place but there are several plying their trade in Brazil who will also be hopeful of making it. The likes of Cássio, Vanderlei, Diego Alves, Weverton and perhaps even Marcelo Grohe could all feature; only their form in the run up to the tournament will decide. The centre-back spot appears a straight battle between Rodrigo Caio, Jemerson and Gil and the reserve central midfield place has been Giuliano’s until now, but he is yet to really impress. Shakthar’s Taison has been favoured as the wide attacker but Douglas Costa will surely be making a strong case at Juventus this year, fitness permitting. As for the final centre-forward spot it is anyone’s guess. Diego Souza of Sport Recife has looked more than capable when called upon to fulfil that role, Grêmio star Luan is another option and there have even been calls in Brazil for the return of a more physical presence such as Jô or Fred, the villains of the 2014 debacle. Tite has two more qualifiers in October and two friendlies, probably against England and France in November, to experiment. After that he will be very close to deciding whose names will be on that final 23-man list. Finally, there were some heart-warming scenes on the pitch after the final whistle on Tuesday night as the players embraced one another and chatted like old friends. Since that World Cup quarter final in 2014 Brazil versus Colombia games have been violent affairs as grudges and unsettled scores boiled to the surface. This time though the mood seemed to have changed. After the horrific air disaster with Chapecoense the stirring reaction of the Colombian people brought the two countries much closer together. After Tuesday’s game Fernandinho told Brazilian television that, because of what they did, the Colombians now feel like “brothers”. It is lamentable that it took something as tragic as that air disaster to warm relations between the two countries but out of adversity comes opportunity and hopefully it will be the start of a lasting friendship.